Theological retrieval—broadly defined as the effort to draw on the church’s historical theology and practice for contemporary constructive purposes—is increasingly in vogue these days, particularly in the fields of historical and systematic theology. There’s a burgeoning body of literature in this this field, with significant names like John Webster and Kevin Vanhoozer and Oliver Crisp providing leadership and direction. 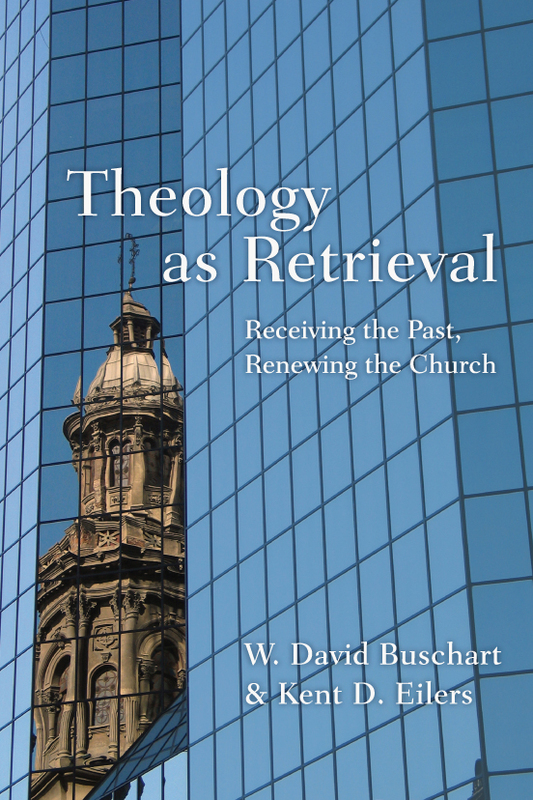 Now in Theology as Retrieval: Receiving the Past, Renewing the Church, David Buschart and Kent Eilers (professors of theology at Denver Seminary and Huntington University respectively) offer the first comprehensive, book-length treatment of theological retrieval as a contemporary movement. Theology as Retrieval shares many similarities to Michael Allen and Scott Swain’s Reformed Catholicity: The Promise of Retrieval for Theology and Bible Interpretation, a book published several months prior that offers a specifically Reformed account of retrieval [review]. But the two books are also helpfully complementary. While Swain and Allen go into greater depth on theological issues involved in the nature of retrieval (e.g., the meaning and implications of sola Scriptura), Buschart and Eilers, by focusing on six different “typologies” of retrieval, provide an overall sense of what it looks like in practice. Reformed Catholicity, that is to say, offers us more answers to why questions; Theology as Retrieval offers us more answers to how questions. Swain and Allen give us a manifesto; Buschart and Eilers a model. In the introduction Buschart and Eilers provide a survey and analysis of this diverse movement, and then in subsequent chapters trace out six areas where they believe retrieval theology has been particularly useful: Scripture, theology, worship, spirituality, mission, and the cosmos. Their conclusion draws together what can be learned from these examples of retrieval and offers a taxonomy of different outcomes of retrieval, and their epilogue encourages various dispositions, capacities, and disciplines that will help retrieval theology flourish in the future. Each chapter is carefully and deliberately structured, and it’s a strength of the book that it hones in on six specific doctrines/practices since books on method often tend toward abstraction and self-focus. Buschart and Eilers are alert to this danger, and explicitly state their desire to stay “close to the ground” by rooting their analysis of theological retrieval in its actual practice (14, 37). How’s This Different from What Christians Have Always Done? Sometimes those skeptical of or uncertain about the current trend toward theological retrieval understandably wonder: is this anything new? Haven’t Christians always retrieved the past? Buschart and Eilers agree that retrieval is, in one sense, nothing new. The impulse of looking back to look forward is part of the basic DNA of Christian identity, since the deposit of faith has always been handed down by a process of reception and transmission (15–22). Retrieval is simply an intensification of the normal Christian posture toward history. What has made theological retrieval of particular importance today, according to Buschart and Eilers, is the need for fresh theological resources in our own historical and cultural setting in the modern (or, if you prefer, postmodern/late modern) West. At the heart of the ethos of modernity is “emancipation from authority, from transcendence, from prejudgments, and naturally then from tradition” (23). This has resulted in a whole host of stalemates and bifurcations (text vs. meaning, Bible vs. theology, church vs. academy, intellectual vs. spiritual, etc.) that pre-modern resources may help us overcome. It’s against this historical background that it’s easiest to discern the parallels between theological retrieval and the “theological interpretation of Scripture” movement, which Buschart and Eilers cover in chapter 1 as an example of theological retrieval. Buschart and Eilers often emphasize, particularly in their chapters on worship, spirituality, and mission, how retrieval might specifically resource North American evangelicalism. For instance, they emphasize church architecture, the hymns movement, and the Book of Common Prayer as a palliative against the shallowness of much late 20th-century contemporary worship music; they defend various historically informed approaches to spiritual disciplines against the common evangelical charge of escapism; and they explore various efforts at “re-monasticism” in response to the excesses of the modern church growth movement. But they also display interest in how retrieval might resource different branches of the church: liberal Protestant, Roman Catholic, Orthodox, Pentecostal, Barthian, and so on (e.g., 28). The word discernment is an important one throughout Theology as Retrieval. Buschart and Eilers define theological retrieval as “a mode or style of theological discernment that looks back in order to look forward” (12, italics theirs), and the book’s purpose is to “uncover the logic of retrieval in order to foster theological discernment about the employment of tradition in Christian theology” (257, italics theirs). They acknowledge that inherent to the task of retrieval are “tensions of constraint/freedom, continuity/discontinuity, and stability/development” (268), and make clear their own Protestant conviction that Scripture is the norming norm in the process of discernment (e.g., 278). Their concluding taxonomy also offers evaluative reflections on strengths and weaknesses involved in different kinds of retrieval (269–275). When it comes to how to navigate the critical tensions involved in retrieval in specific cases, however, Theology as Retrieval tends to be more descriptive than evaluative. For instance, using a music analogy, the authors compare more innovative approaches to retrieval (like the radical orthodoxy of John Millbank) to jazz, and more constrained approaches (like Fred Sanders’s appropriation of the Trinity) to classical music (251–254, 267–269). Bushcart and Eilers don’t adjudicate between these two different approaches—which raises important questions regarding how much (and what kind of) flexibility is appropriate in retrieving the past. Jazz and classical are pretty different. The need for further refinement of the nature of retrieval prompts me to articulate one concern—which is less directly related to Buschart and Eilers’s book and more concerned with the retrieval theology movement as a whole as it moves forward. If retrieval theology continues to grow in popularity, we should be sensitive to the temptations that often arise when a particular set of shared loyalties or instincts becomes trendy or faddish. In the case of theological retrieval specifically, we should guard against the danger of past resources and present needs being mushed together in a way that feels a forced or inauthentic, or (in the worst scenario) the present need distorting the shape and character of the past. If we start getting books, for instance, on how Basil of Caesarea’s sacramentology can solve all of Greece’s financial problems, or how Kierkegaard’s notion of the self redefines our ecological situation, or how Zacharias Ursinus’s doctrine of predestination is the answer to urban overcrowding, then we may perhaps be justified in having suspicions that the procedure has outpaced the purpose. In the other direction, it would be wrong to dismiss a movement simply because it grows trendy. Church history indeed holds rich storehouses and treasure fields of wisdom to help us navigate our cultural moment, and Buschart and Eilers, while perhaps not bringing resolution to all disputed questions regarding how it is best done, have significantly advanced the conversation. We should be grateful for their intelligent and articulate contribution, and eager to join in ourselves as the conversation moves forward. David Buschart and Kent Eilers. Theology as Retrieval: Receiving the Past, Renewing the Church. Downers Grove, IL: InterVarsity Press, 2015. 319 pp. $28.00.